Roland KD7 Kick Trigger, available in Taal Musicals.com, vijayawada. Beater and connection cable (kick drum pedal not included). Roland Drum Sticks for Rhythm Pad, and Jazz drums Etc., .. 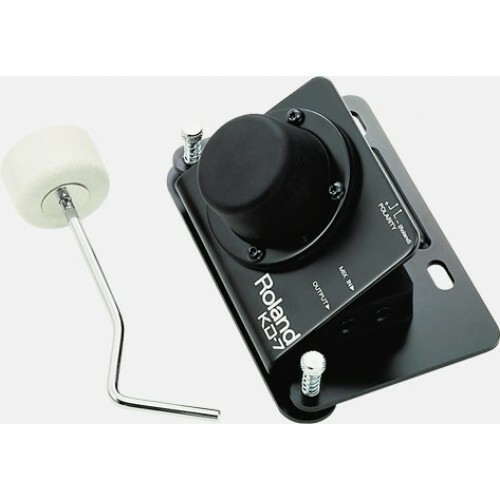 The KT-10 from Roland provides the authentic feel of a kick drum pedal in a low-noise, kick trigger ..
FEATURESLow-profile pad controller - excellent for playing or entering drum dataSixteen solid, respo.. Features:Low-noise operation for late-night practice (50% less noise in your practice space and 15% .. The latest pad-sensing technology developed for V-Drums provides even and accurate pad triggering wi.. The latest pad-sensing technology developed for V-Drumsprovides even and accurate pad triggering wit..
Versatile, self-contained percussion instrumentBriefcase size for easy travelIncludes a broad select.. The Behringer Xenyx Q802USB Premium 8-Input 2-Bus Mixer is versatile, feature packed and i..
Roland FD-8 Hi-Hat Control Pedal. Thanks to Roland’s new FD-8 Hi-Hat Controller, drummers can get mo..